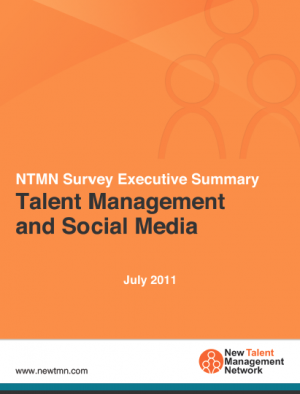 A new nationwide Social Media study reveals surprising news: Talent Management professionals have been slow to take advantage of social media in their personal lives, which may indicate a reluctance to use the same channels for business. The survey, sponsored by BRANDEMiX, was conducted last month by the New Talent Management Network, a global network of more than 2500 talent management professionals founded by consultant, author, and speaker Marc Effron. Similarly, while a third of respondents read other people’s Facebook pages “more than a few times a week,” 43% posted content on their own pages “less than once a week.” Another 13% “never” posted on their own pages. As for YouTube, though 85% of respondents reporting watching others’ videos at least once a month, that same percentage also claimed that they “never” posted their own video content on the world’s second-largest search engine. Compared to general human resources professionals, whose use of social media to engage job applicants has been steadily increasing, talent management professionals have yet to embrace these new channels. Even those in talent management who use social media are less influenced by its content and rely on it less for information than other populations in human resources. A copy of the complete survey can be downloaded here.